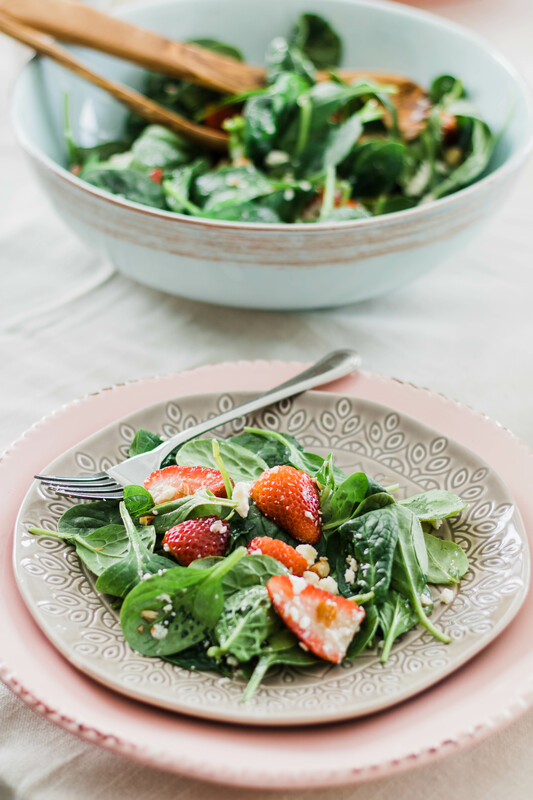 Strawberry Spinach Salad with Balsamic Dressing. 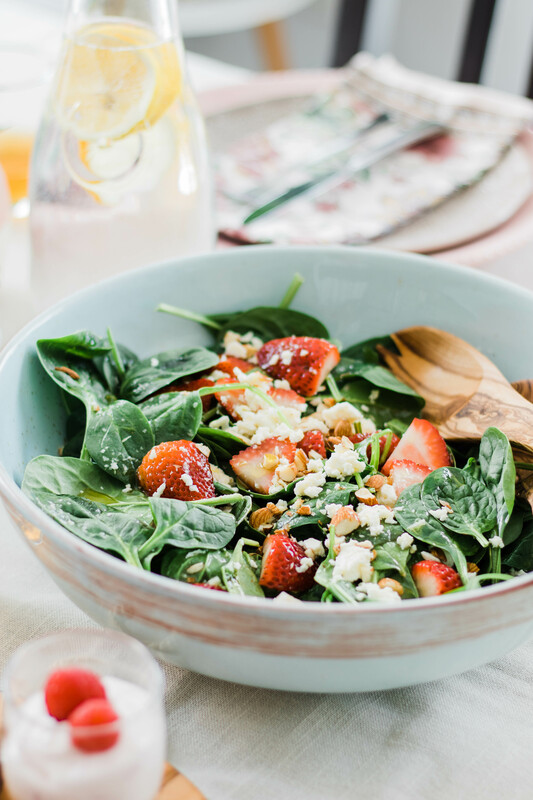 Strawberry and feta spinach salad, drizzled with homemade balsamic dressing—The perfect effortless side to put together. 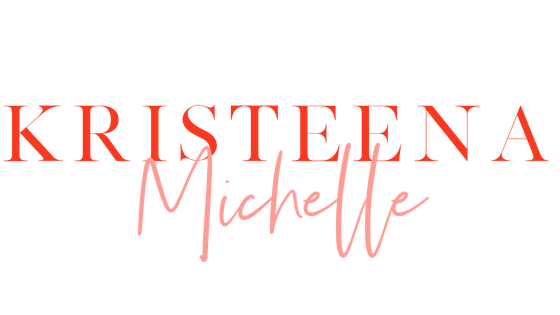 Click here to see the full Spring dinner Party! When I’m hosting a dinner or just wanting to get a side on the table quick, my go-to is always salad…and bread. ? You just can’t go wrong with salad. It adds more veggies to the table and takes little to no time to whip up! Now, I’m probably getting ahead of myself but when I saw strawberries at my local farmer’s market, I couldn’t hold back from buying a few containers. I am over the top excited about strawberry season which I know is still a couple months away, but I just couldn’t help myself! They are one of my favorite fruits, after pineapple of course. 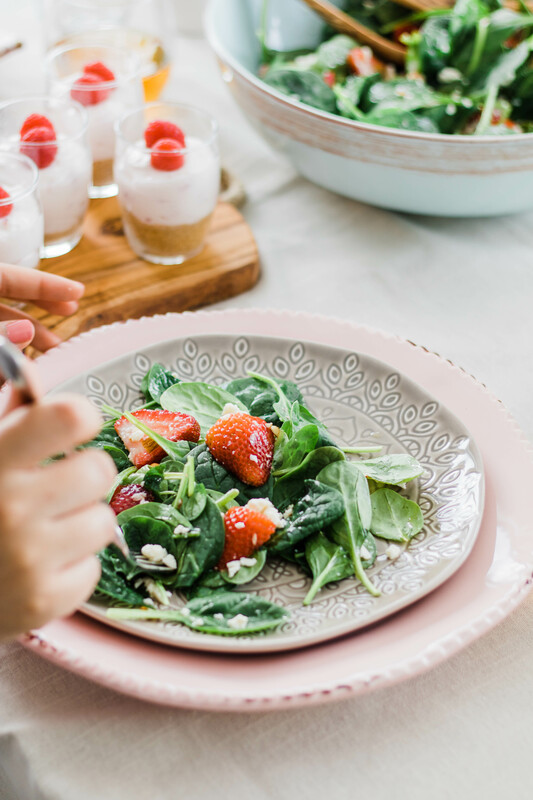 So if you’re as impatient as I am and want to get a jump start on all the yummy strawberries, then this salad is for you. 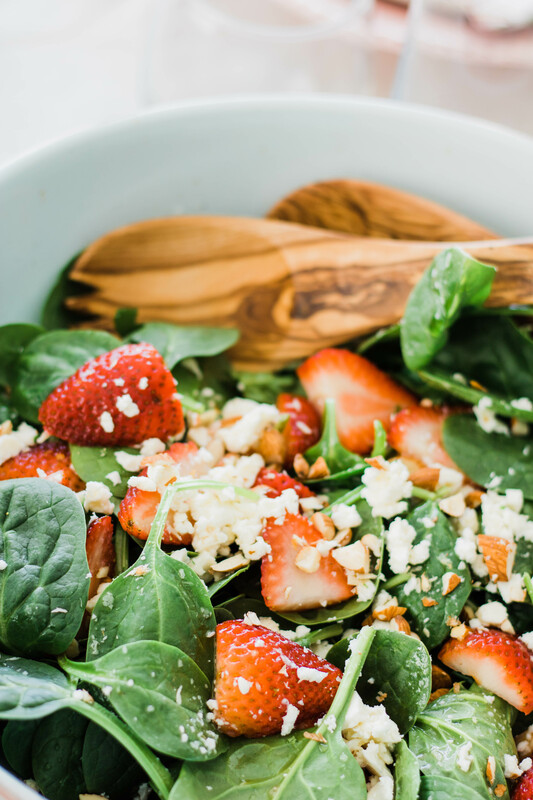 This salad is loaded with strawberries, feta, and balsamic dressing to marry all the delicious flavors together. In this recipe, I combine everything in a bowl and toss, but I also like to make balsamic dressing before hand and store it in the fridge till I’m ready to use it. I find the consistency a little thicker, which I prefer, but if you’re pressed for time, it will taste just as good mixed all together right away. I’ve also added chopped almonds, but you can add your nuts of choice! Walnuts would be really good or even pecans. In a large bowl, toss spinach, olive oil, balsamic vinegar, and pepper. Add strawberries, almonds, and feta. Toss again and serve. Berry Pancakes with Greek Yogurt Sauce. Previous Post Cauliflower Steaks with Lemon Tahini Dressing. Next Post No-Bake Lemon Raspberry Cheesecake Cups.